Without fail every Christmas season, I make panettone, the classic sweet yeast bread that is studded with dried fruit and that Italians love to give as gifts at Christmas time. And every year I receive imported panettone from friends and family. 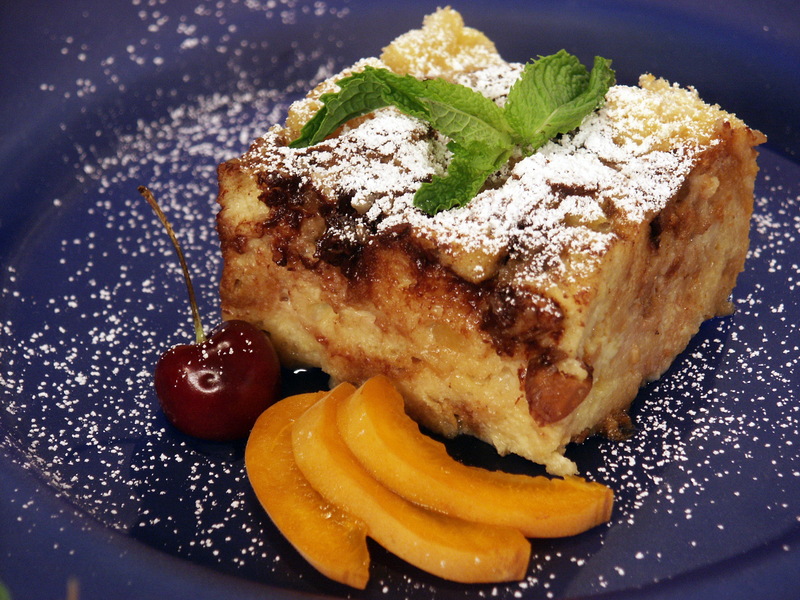 Some I stash in the freezer and use for toasting; some I hollow out and stuff with ice cream and some becomes a luscious bread pudding perfect for a winter’s Sunday breakfast. Butter a 9 1/4 by 13 1/2-inch oven-safe casserole dish. Put the figs into a small bowl and pour hot water over them; allow the figs to soak for 10 minutes, then drain and set aside. Bring the milk and cream to a boil in a large saucepan. Remove from the heat and stir in the cinnamon, nutmeg, salt, orange and lemon zests. Whisk the egg yolks in a large bowl until light and fluffy looking. Whisk in the milk mixture. Beat the egg whites in a separate bowl with a hand-held mixer until soft peaks are formed. Sprinkle on the sugar and fold into the whites. Fold the white mixture into the egg yolk mixture. Fold in the bread pieces and the figs. Pour into the casserole dish. Place the casserole into a large pan like a roasting pan and pour hot water into the roasting pan until it reaches half way up the sides of the casserole dish. Bake until a knife blade inserted in the center is just slightly wet. This may take between 1- 1/2 to 2 hours. Remove the baking pan from the roasting pan and wipe the bottom with a towel. Serve warm cut into squares garnished with whipped cream. Hi MaryAnn, we had some panettone left over New Years ,w eggnog , pre made from store ,added most of your same ingredients ,minus Marsala ,it came out as a favorite bread pudding .